After a few days of little sleep my body decided enough was enough! I decided to try and take a short nap today (I am so not a napper) in hopes that I could get an hour or so of rest. Well, after a doorbell that got me just as I was in that blissful in-between state and then a phone call just as I was just getting comfy for the second time, I finally succumbed. I cannot believe that I slept for about three hours! Three hours! Was she tired, or what? I did not awake refreshed and ready to take on the day ~ it was already 1:30 pm! The cold was back today but not so cold that I needed to dress like Nanook from the North! Off Zeke and I went in search of a nice path. Most was frozen over but there were mucky parts galore. ‘Twas difficult to choose the right path. We ended up in one of our parks and I decided to get close to a lovely weeping willow standing out in the oh-so blue sky. Focussing on the final destination, I was less focused on the path. So, what looked frozen solid was in fact, not. Sunk down to my ankles in my not-so-waterproof boots. Blast! Had to turn around and hightail it back home as soon as possible before the wet seeped completely to my poor tootsies. So, no pictures of our walk today ~ well, none worth sharing, anyway. Two days ago I was fascinated by the transformation of my bouquet that I received on Valentine’s Day. Remember how lovely it was? Well, it has been hanging around since! The flowers were slowly fading yet had a beauty to them that I just wasn’t ready to throw away yet. The light from my living room was just right and I snapped away. Today’s society is quick to dismiss the ageing population, no longer seeing the beauty that remains, maybe just a little faded but often still vibrant. 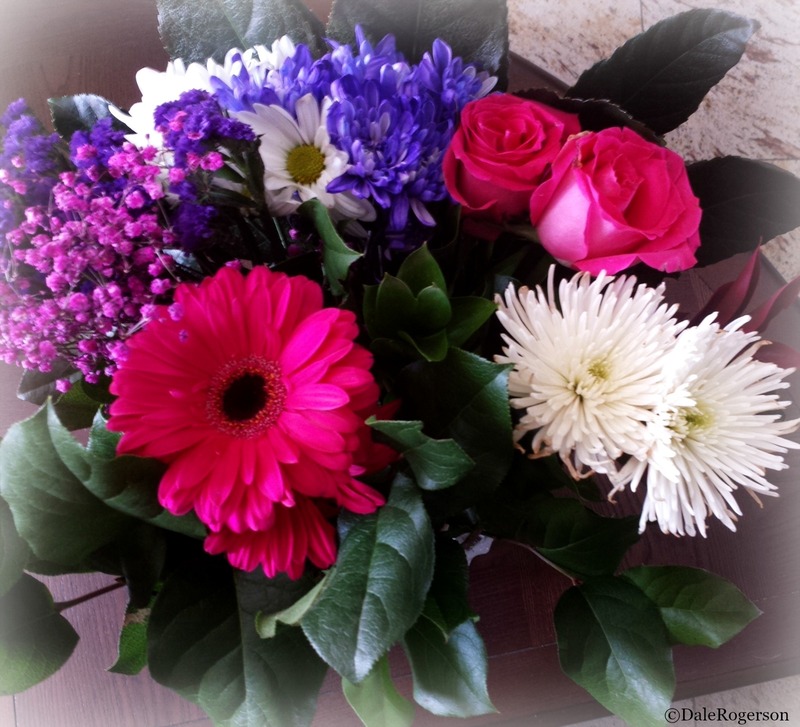 This entry was posted in fun stuff, Photography and tagged ageing society, bouquets, Fading beauty, flowers. Bookmark the permalink. Of course you knew I’d *like* this. A lot! And of course you know why..
Of course, you beautiful woman! I’m so NOT a napper either! Well the flowers may not have gotten better with age, but they had longevity going for them. Me too! To go from such a vibrant colour to the pretty papery pink. Yes, love rosehips – make a great jelly to boot! They will because I will simply avoid anything remotely close to resembling a possible hidden lake! What a great idea. There is beauty all around us, if we stop and look. Even those that age. Very nice thought. Hooray for your nap … even three hours with interruptions. You must have been one tired pup. Meanwhile, well done on the images and the comment. I was frankly surprised that I did. Oh, the 3 hours was after the interruptions!